Colloide provides circular and rectangular scraping systems (plastic and steel) for settlement and flotation tanks. These tanks are generally rectangular or circular, designed to separate out the solids from the liquid by either settlement or flotation. a rotating bridge structure powered by a peripheral drive unit. The bridge supports a frame below it onto which is fixed sludge scraping blades at floor level and a scum blade at top water level. The sludge scraping blades divert the sludge to a hopper while a side-wall scraper can also be fitted to ensure the base of the internal wall is scraped. The scum blade diverts the scum to the outer wall of the tank where it is collected into a scum box once every revolution of the bridge. a fixed bridge mounted on the walls of the tank. 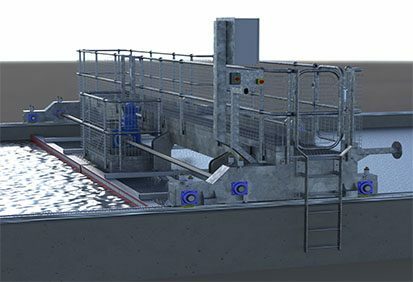 A central drive unit rotates the scraping mechanism around the tank, the sludge scraping blades diverting the sludge to a hopper while a side wall scraper can also be fitted to ensure the base of the internal wall is scraped. 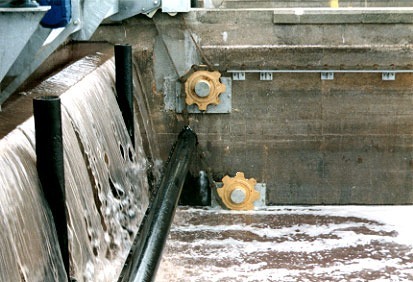 The scum blade diverts the scum to the outer wall of the tank where it is collected into a scum box once every revolution of the scraper mechanism. A chain and flight principle is used for rectangular tanks, consisting of two main chains which move the scraping booms up and down the tanks. 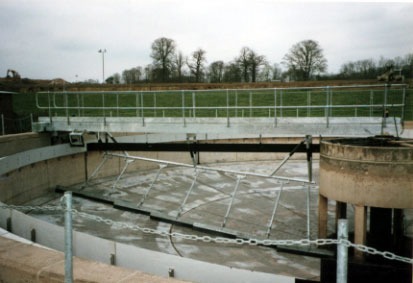 When scraping at top water level, the booms push the floated material to one end of the tank, where it is collected by a rotating sludge pipe or, alternatively, a collection channel with an adjustable weir. Complete design, manufacture & installation of mechanical and electrical systems available. Rectangular settlement tanks and scrapers available, offering maximum use of space. Designs suitable for heavy duty applications, delivering long life with minimum maintenance. 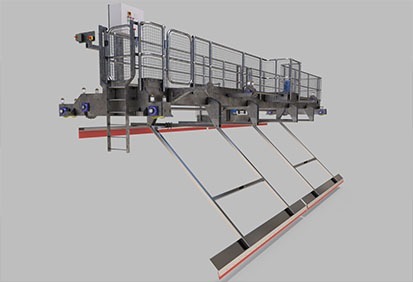 Retractable scraper blade assemblies available for rotating bridges. Equipment available on a short lead time. Alternative features can be easily incorporated. 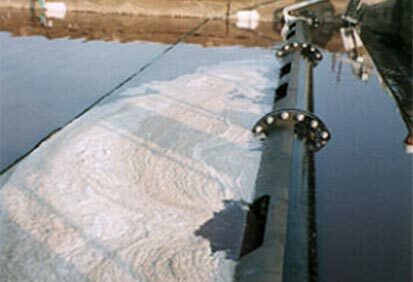 Applications include: primary settlement tanks for wastewater treatment; final settlement tanks for wastewater treatment; rectangular settlement tanks for wastewater treatment; rectangular dissolved air flotation tanks for drinking water application; rectangular dissolved air flotation tanks for wastewater treatment.